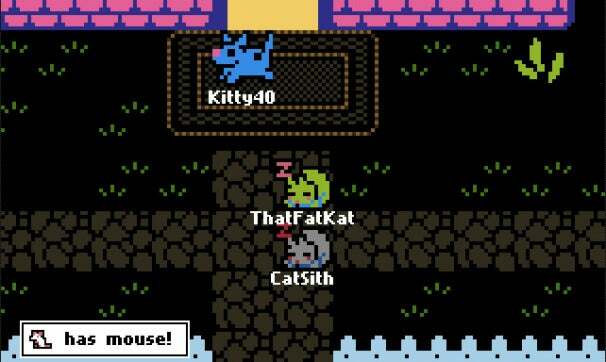 Cat Life: ChatChat is a free, browser-based MMO all about being a cat. There are no classes, leveling, crafting, dungeons, or loot other than dead mice to leave as offerings at a human’s doorstep. The game is all about meowing, purring, napping, frolicking, and hanging around cats. Such is the life of a cat. The game comes from Terry Cavanagh, the same creator of the gravity-flipping indie-platformer VVVVVV, with graphics by Hayden Scott-Baron. There are some secret rooms like the one with a dog altar that you can sacrifice a mouse to become a dog and turn other cats into some kind of dog-cat zombies. You can play ChatChat for free at Kongregate.